This Easter, VetSupply is coming up with an exclusive range of Combo offers that not only assures double benefit for your furry pal but also has great value for your pocket. 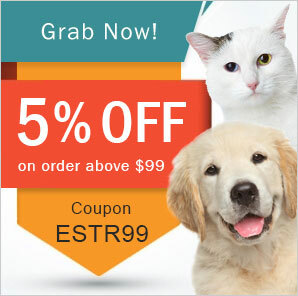 Last year, VetSupply had an Easter sale with huge discounts on major pet essentials. And, this year we are back but with A Special Easter Sale Magic giving away surprising discounts on budget-friendly combo bundles and top brand pet products. However, don’t miss those vet essentials as we have surprising offers on them as well, including the range of pet hygiene products, dental care, grooming, shampoos and accessories. This Easter – The combo offers come at an extra discount with FREE SHIPPING benefit to stock for the winters. So, skim through the various offers and pick your specifics to gain surprising discounts at the checkout. Check here the major combo offers that you can benefit from. If you are looking for a wide spectrum protection against multiple parasites, here comes the saviour – Heartgard + Nexgard Combo pack. The two most popular parasitic treatments having bundle of advantages for pets and pet parents, combined in this combo pack is unique due to its exceptional capabilities of treating various external and internal parasites. The high value combo pack is powerful in destroying multiple parasites including fleas, ticks and worms. Moreover, designed with potent immature heartworm killing ingredient, the pack has the capacity to protect your dog against harmful heartworm disease. This pet-friendly pack comes at special price this Easter with an added discount on auto-orders. This Australian treat is rich in varied nutrients that are necessary for your pet’s day to day requirement. These treats are prepared with a special air drying technique which keeps the nutrition intact and the vitamins and minerals in the meat are easily digestible. These treats are also good source of vital nutrients including biotin, magnesium and potassium that are essentially required for maintaining good health. These treats are available for both dogs and cats in varied flavours such as kangaroo, salmon, chicken, and lamb. The big deal about Balanced Life treats is that the combo pack comes at the lowest price is only available for this Easter Sale. Easter is a period between autumn and summer. A perfect environment for fleas and ticks to thrive and have their autumn blood feast on your dog. And therefore, there comes the need for a bulwark to shield them for the coming winter from flea and tick infestations as well as heartworms. And, Nexgard + Interceptor Spectrum combo pack is the better option that works as the best protector safeguarding dogs against the severe health conditions due to fleas, ticks, heartworms and worms. The Combo Pack includes – Nexgard and Interceptor Spectrum – A flea & tick treatment and heartwormer. Looking for the longest flea, tick & worm protection? Well, Bravecto + Milbemax combo pack emerges out as the best option. This combo pack provides as long as 3 month protective shield against fleas, ticks and heartworms. Providing a broad spectrum protection, these chewables are highly palatable and easy to administer. This is a great value combo pack, as the treatment provides complete protection against the various parasites for the coming winter season. Buy this pack of two oral treatments at the lowest price before the Easter Sale ends! Why You Should Not Miss This Easter Sale At Vetsupply? Check VetSupply Easter SALE NOW!! !